A capacity crowd in the auditorium at Oaklands provided an exceptional atmosphere on the first day of the 2016 Inglis Premier Yearling Sale, where strong competition led to records being set in the Blue Riband Session and a new top price for a filly in Melbourne. CLICK HERE to view the InglisTV Day 1 Summary. Adam Sangster’s Swettenham Stud are renowned for selling Black Caviar at the sale in 2008 and the Victorian based stud was back in the spotlight today. Their filly by Fastnet Rock from Hidden Energy (Lot 47) set a new record price for a filly sold at Inglis Premier when secured for $675,000. From the family of Kaphero and Solicit, the filly was knocked down to Mornington trainer Pat Carey and Group One Bloodstock. “She’s by Fastnet Rock and he needs no introduction - his fillies have been outstanding. The client that purchased the horse is keen to invest in fillies for breeding down the track, and she’s from a family that produces top-class fillies and they have enormous residual value attached to them once they come off the track,” Carey said. “I knew that this type of page wasn’t going to come cheap and we were well prepared for that. The market is hot for these types of fillies,” Carey added. The second top priced lot of the day was another daughter of Fastnet Rock, which sold from the Blue Riband Session (Lot 118). Offered from the draft of Blue Gum Farm, the filly is out of a half-sister to Holy Roman Emperor and four other stakeswinners and was secured with a bid of $460,000 from South African trainer Brett Crawford, who was back at Premier after securing the top lot last year for $560,000. Now in its fourth year the Blue Riband Session recorded spectacular results with 37 lots sold at an average of $189,000, up 41% on last year. Eight lots sold for $300,000 or more in the select session for yearlings bred and conformed to excel over middle and staying distances, underlining the great depth to the competition at Oaklands. “The decision to hold the Blue Riband session on the first day of the sale has given the bulk of the population who visited on Sunday the chance to experience the theatre of active and aggressive bidding, which continued through to the final lot that sold for $300,000,” said Inglis Victorian Manager Simon Vivian. “It was an exciting day on a range of fronts and we acknowledge the support from both vendors, who presented top-quality horses, and from the national and international buyers who provided strong competition on many of the lots through the ring today. “Going into the sale we were confident that we had more quality than ever, and this has been reflected by the demand from the buying bench. “While there have been some outstanding results, there has also been excellent buying, with plenty more to come over the next three days,” Vivian said. In addition to the many return buyers, there was great participation today from new entrants into the thoroughbred industry, who took advantage of the Syndicators Centre on the TAB Lawn behind the pre-parade ring. The Centre featured 14 syndicators along with GetRacing.com.au and will be open again from 9.00am until the final lot is sold on Monday. “The Sydnicators’ Centre appears to have been well received with a significant number of enquiries having been made by people not previously involved in racehorse ownership. We are delighted to give companies a platform to feature their services, and to give people a chance to open the door to becoming involved in our spectacular sport,” added Simon Vivian. 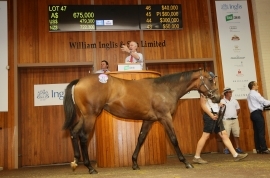 Inglis’ Make-An-Offer Service is available for lots which passed-in on Day One at the Inglis Premier Yearling Sale. Day Two of the auction starts at the earlier time of 10:30am tomorrow where Lots 151 to 362 will be offered. The next two days of the 2016 Inglis Premier Yearling Sale will be broadcast on via Racing.com’s great free-to-air coverage on Channel 78 and Inglis Sale Day Live, plus Online Bidding and Make-An-Offer will again be available.